Fatalities are one of the highlights of any Mortal Kombat game; so it's good news that they will be easier than ever to pull off on the new instalment. NetherRealm Studios has confirmed that Mortal Kombat X will feature an Easy Fatality Mode, allowing gamers to pull of the series' signature moves with ease. Since it blew up in the 90s, Mortal Kombat has required gamers to follow complicated button routines to perform Fatalities, but sometimes it's easier said than done. Under pressure, with a time limit on the screen and your mates shouting in your ears, it's quite easy to buckle and simply finish your opponent off with a half-arsed punch to the face. That's where the new Easy Fatality Mode comes in. NetherRealm community specialist Tyler Lansdown confirmed during the studios' recent live stream that a small skull seen near the bottom of the screen in previous videos was related to easy Fatalities. "Now, we've learned through years and years of study that there are a lot of people who just can't pull off Fatalities, or they get freaked out or they can't figure out the timing," Lansdown said. "So when the game launches, you'll have a couple of those--maybe three of them--day one. You'll have those just to use and do easy Fatalities on. "There are certain places you can unlock those and things like that. So you'll always have access to easy Fatalities--if you want to use them." On top of that, it was confirmed during the live stream that Goro would be sold as a DLC in the future. We also heard last month that Predator and Spawn may be included as well. Mortal Kombat X will be released on April 14 for PS4 and Xbox One. The PS3 and Xbox 360 were recently delayed and are now due out in the summer. 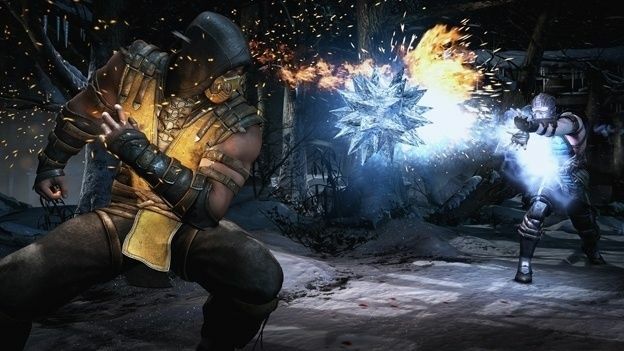 Until then, you can check out our Mortal Kombat X preview.